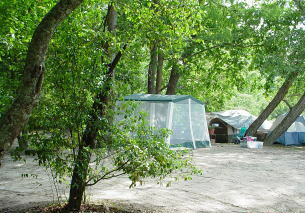 Over seven acres of shaded camping area overlooking the scenic Bogue Chitto River from which to choose your campsite. White sand beaches and clear flowing streams border Canoe and Trail Outpost which sets the perfect stage for any occasion. Reservations are not required. Primative camping is on a first come first serve basis. Cost is $6.00 per person per night. Campground facilities available to our guests are restrooms, hot showers, ice, vending machines, river supplies, swimming and fishing. We sell firewood.